I was in New Zealand for a gathering of very large database geeks, so I decided to spend a couple of extra days there and go diving. 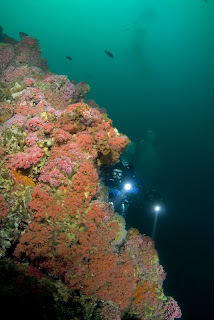 I was in Auckland, and the nearest place that is supposed to have good diving is the Poor Knights Islands (which, if you believe everything that you read on the web, were on Jacques Cousteau's top 10 places to dive in the world). 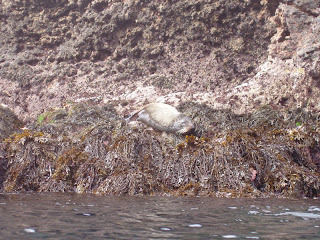 They are about a 45 minute boat ride from the Tutukaka coast, which is about two and a half hours north of Auckland. Or three hours, if it is your first time driving on the left side of the road, and you are terrified of twisty mountain roads. The drive up there was pretty scenic, with some great views of the Pacific as you come over the hills. I dove for two days (Friday and Saturday) with Dive! Tutukaka. 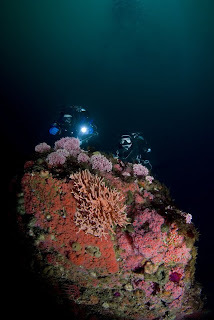 I chose them out of the several dive operators there using a complex formula including the Google page rank, how pretty their website is, and what I read on Scubaboard (that they are probably the most likely to go out on any given day during the winter). On Friday, all of the divers (a total of 6) were out of towners, and none had dived there before. Most were pretty inexperienced divers, which I was a little surprised by since it is a cold water destination. I buddied up with the other experienced guy on the boat (Brendon, who also happened to be an instructor back in Australia). So I guess I got pretty lucky with my first insta-buddy experience. I had brought Rob's old point and shoot camera (sans strobe) to take some pictures. I have only used it a couple of times in the past, and didn't really remember all of the settings, so Rob instructed me to just point and shoot, and not bother fiddling with the settings. That sounded good to me, especially since I didn't know if I would end up diving with someone who wasn't very tolerant of waiting around while I doodled with the camera. 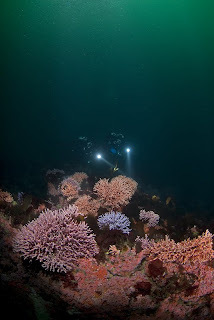 Anyhoo, we were on the "Bright Arrow", which is 11.5 meters long, and was quite comfortable for 6 divers. They do things a little differently there... we got all the way out to the site before anyone really starting setting up gear or getting into their suits (I put my suit on before boarding the boat which got me some strange looks). I guess this works well when the water is crazy calm, as it was. When we got to the first site, they gave us a spiel about the islands, their geology (they are part of the rim of an old volcano), history (natives pillaging each others' settlements), fauna (fish, birds, and bugs), etc. It's a marine reserve, so it is no-take pretty far out from the islands. Apparently the islands have no rodents, but instead they have giant bugs. Ewww. Or maybe that is just what they tell people to keep them from going on the islands (which is not allowed). Overall, I thought the diving was definitely worth the side trip. 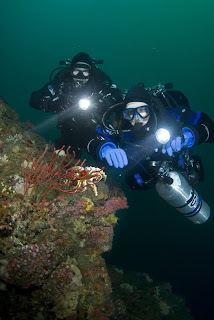 If I went back to New Zealand, I would probably try to dive some other spots too (like the south island, where they allegedly have weedy sea dragons!). All of the pictures are here. On Saturday, we went on a much anticipated BAUE charter to Big Sur Banks. Long anticipated too -- on the first day of Tech 1, when we had to introduce ourselves and say why we were taking the class, Big Sur Banks came up during Rob's spiel. Then for the rest of the class, every time Beto was describing a scenario to us, it was at Big Sur Banks :P So, at long last, Saturday at 6 AM we took to the high seas (actually the seas were quite low). The sea conditions were really stellar, I even got a few wink winks in on the way down. It was a bit overcast and chilly, but the visibility over the water was good by the time we got down there. However, I didn't want to take any chances with having to hurriedly get geared up in big barfy seas, so I strategically got dressed over the course of about an hour before we got down there. Once we were down there, we started to gear up before the hook had even been set. The plan was to drop a grapple, to minimize any damage to the reef, with a float ball attached to it. Actually there were two floats, the idea being that the line between them would serve as a current line on the surface. However, Neptune had other plans for that ball, as it was sucked underwater by the current. One of the DMs hopped in with another little float with line on it and attached it to the ball left on the surface. Luckily that ball was not swallowed by the ocean, so we were left with two floats connected by a granny line. This was all going on while we were sitting on the benches with our gear on and bottles clipped to us. My upper back was killing me from hunching in my doubles trying to stay comfortable. Anyhoo, once everything was setup, we all Geronimo'd off the side, and drifted into the line. Then the fun began. After sorting out the two teams on the line, we started our descent, against a ripping current. Now I know what the term "ripping current" is meant to describe :) In about 20 feet, tons of salps came streaming by in the current. We were pulling ourselves down the line slowly (the one upside of which was that I had no ear problems whatsoever! ), but really not slowly since I was getting pretty winded on the way down. I kept cracking open the knob on my reg until finally it would open no further :( At around 100 feet, I decided I needed a little break, so I told the boys we needed to stop for a moment. I was trying to signal something useful to them, which proved tricky since I was holding on for dear life with one hand, and had my light on the other hand. But I think they got the idea. The pause was surprisingly refreshing, as hanging like a flag in the wind wasn't really hard, except perhaps on my hand. After a minute, we continued down (after a little team re-ordering, since Rob had skipped ahead of me on the line earlier). As we got to 120', I started to get mighty suspicious of the lack of pinnacle. Soon it became clear that the hook had slipped, and instead of a pinnacle from 120-ish to 160-ish, we were over sand in about 170', which was littered with small boulders topping out around 160'. At this point we were about 10 minutes into the dive, and it seemed pointless to abort and try to reposition. For one thing, I was probably too pooped for another long descent against the current, but I also probably didn't have the gas, and the time constraints for the day would have made it tough as well. It also didn't seem feasible to try to find the pinnacle, since it would no doubt require swimming against the current, which I know I was in no mood to do. So we decided to just poke around where we were, and shorten the dive as necessary due to the depth. The problem with the low-lying boulders was that nothing was there to protect us from the current, so even once we got down, we still had to contend with that. We pretty much swam around a handful of these boulders for a while. One that we came upon pretty quickly actually had a nice bushy piece of pink hydrocoral. All of the boulders had hydrocoral in decent quantities, but it was mostly the more two dimensional sheets that I don't think are nearly as pretty as the shrubs. There were also gorgonians and lots of Hermissendas, including the red and peach tipped ones that I find very attractive. After visiting some of the other boulders, we sort of gravitated back to the one with the pretty hydrocoral bush, and Rob took some pics (which was an amusing feat due to the current). Before you know it, it was time to head up. We ascended to 120', and Rob shot the bag from there (we had planned to shoot it from the "reef" but I didn't know how a 150' spool would fare from 160' :P). We were diving in two shifts, so the second shift for the first dive had the benefit of the hook being moved back to the pinnacle, sort of. This time Phil used the big boy anchor, and anchored the boat. As a result, the teams had to make it from the gate to the front of the boat, just to get started down the line. This proved an insurmountable feat for the swimming team (despite Phil's supportive cheers about the size of the teams' reproductive organs). The second team was on scooters, and tried to give the swimmers a tow, which resulted in the scooters moving backwards. Yikes. After 10 minutes or so of getting their asses kicked on the surface, the swimming team ended up sitting out the dive. We had a while before our next dive, during which we swapped gear out and had some food. Apparently reporting on the contents of my lunch is lame, so I will have to skip that today. When Beto and Susan returned from their dive, they told us about a "big" shark that was hanging out on the top of the pinnacle during their dive. Hmmm, I wasn't sure whether to be terrified or excited. In any case, I decided to just put it out of my mind for the time being. Then we sort of regrouped and discussed what to do next. 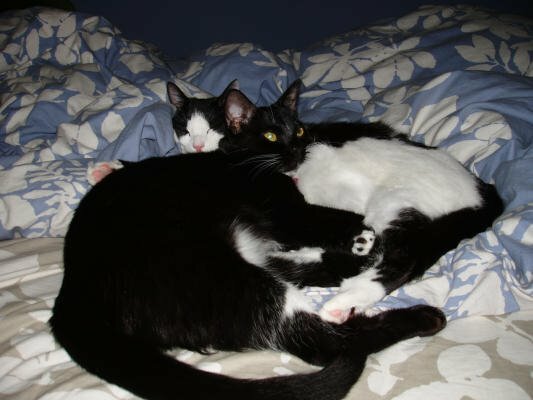 We considered moving to a site closer in, which would hopefully have less current. However, we decided to give it another try here, and to risk not getting another dive in vs. going to a less exciting site. But it was clear that anchoring the boat was not the way to do it. So, instead, we used the approach we'd used on the first dive (drifting into the buoy) but with the bigger anchor. We got in the water, and swiftly found ourselves at the buoys. We started the descent (right behind Clinton and Nick), which was also a strenuous pull down the line. And a looong pull. There was zillions of feet of scope, it seemed. We eventually dropped off the line, hoping that the pinnacle would shield us a little from the current -- ha! 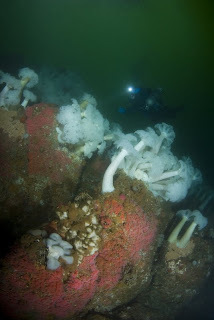 Instead, we were just kicking against the current and deeper :( However, it turned out to be worth it, when I saw a vase sponge (or boot sponge, people seem to call them different things), which I have never seen before! That was neat. We continued along and finally got to the pinnacle at around12 minutes into the dive. 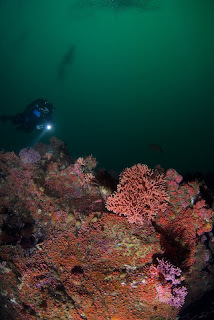 We worked our way up the side of the pinnacle, and ended up settling on top, since that's where all of the really huge pieces of hydrocoral were. 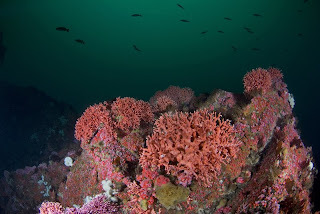 They were incredibly big -- much bigger than any hydrocoral heads I have seen before by a large margin. I tried to pose for a couple of pictures behind various chunks of hydrocoral, which was quite comical -- in there current, it was nearly impossible for both me and Rob to hold a position long enough for him to get any shots. However, we did get at least one nice pose of me and Kevin behind a piece of hydrocoral. I also attempted to pose for Clinton too, but also found that to be pretty impossible. The water was dead calm for the ride back, so we made great time getting home. There was plenty of time to eat, swing by Cynthia's, and still make it home in time for kitty feeding time. All of the day's pictures are here. On Saturday, we scootered at Lobos with Ted. Someone decided we were going to Beto's Reef (apparently Rob and Ted had decided this before I even knew we were diving with Ted). So that was the plan. I managed to negotiate a "late" start of 8:30, hehe. Ted was amazingly unlate (no later than we were, anyway). We decided that Ted would lead us out there, we'd hang out there for a while, then head in shallower, and maybe doodle around in the shallows with the reel (just for practice, since I was saying recently that I haven't actually run line since T1). We scootered out on the surface until we were a little bit beyond the worm patch, and we dropped in the sand channel. We scooted out, and then Ted took us to Beto's in a slightly more east-ish route than I am used to. So we ended up coming up to Beto's on the right side, instead of the usual straight on or left side. So we hopped over to the other side, and scootered out to the end, just for giggles, and then came back closer to the beginning. Then we clipped off and kicked around. Rob was shooting macro, because I guess he has given up on getting glamour shots of Ted :) We were kicking around looking for interesting stuff, but I really wasn't seeing too much exciting stuff. 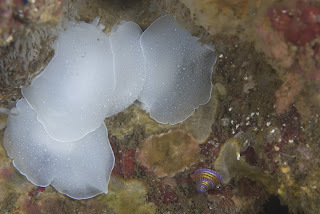 I did find a Eubranchus on some hydroids and an Aegires or two. Of course there was the wolf eel, who we stopped to visit. Rob was poking around looking for the warbonnet but never found him (I am fairly sure he was too far south). I did find this cool little hole that I dropped into and found it was crawling with Berthellas. It was funny, since I hadn't seen any of them elsewhere on the reef, but they had taken over this little cave. There was a lot of mating going on :) Other than that, I saw a very cute sculpin hiding under a piece of seaweed flopping around in the surge, and a big fluffy Dirona. Before you know it, it was time to head in. Saturday we were on the Escapade for a BAUE tech charter. We were hoping to get down to Yankee Point, but the weather gods were not on our side. The wind out of the west was punishing on the trip down, with anything not tied down sliding across the deck every time we got smacked by a wave. It was also really foggy. For much of the trip down, I had no idea where we were. We stopped in the vicinity of the Pinnacles and circled around there briefly, then continued on. The fogged seemed to have cleared around there, but then as we continued on, it became apparent that it was just patchy, and it was still plenty foggy. By this point, we decided to try for E3 or one of the other sites just outside of Lobos. So we motored down there, where it was also quite foggy. It was so foggy that I couldn't really tell what sites we were checking out. After a bit of site shopping, things weren't looking good. Then someone had the bright idea of checking out Montana (instead of heading back into the bay, which was the other option). We headed over there and it seemed doable. A little choppy, but not as foggy as other spots. On the way down, we kept hearing rumors of a really thick layer down to about 60' and then 10 to 15' viz below. I was skeptical. It turned out to be not nearly that bad. The layer wasn't that thick, and once we got to the bottom, the viz was probably around 50 feet. 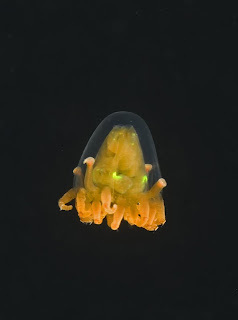 On the way down the line, we saw a bunch of egg yolk jellies (which I never get tired of seeing!). We were anchored near the southeast side, and headed clockwise when we got to the bottom. We were actually moving at a fairly quick clip, and pausing when Rob stopped to take pictures (he was leading). 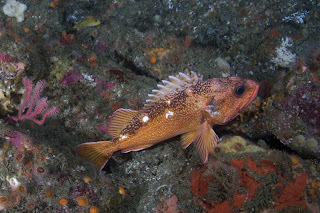 Rob found a starry rockfish, which I was very excited to see. I don't think I have ever seen one before. There weren't a ton of fish out, but there was a good variety of rockfish. 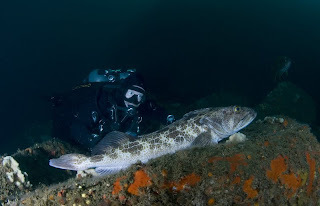 There were also several big lingcod (at least 3, all in one area). A few of the corners of the reef had some very pretty Corynactis and hydrocoral coverage. 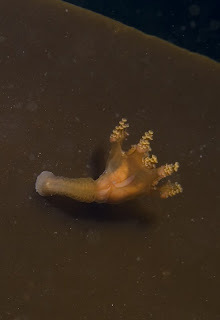 Other than that, we saw the usual small critters -- nudibranchs, simnia snails, and lot of pedicularia snails on the hydrocoral. Before you know it, we had made it nearly the whole way around, and it was time to leave. Kevin was on bag duty and I ran deco (mad with power!). At 50 feet, a big school of blue rockfish suddenly appeared below us and started to swim up toward us. They weren't there at 60 feet, so we must have drifted into them or something. But as we left the 50 foot stop, they lost interested in us. We also saw a lot more jellyfish on the ascent, including some egg yolks -- we had to move Kevin around to avoid them :) There were also a lot of different tiny jelly creatures in the water, which I was checking out and pointing out to the others. I have no idea what these were. The deco was surprisingly pleasant, probably because I was wearing my purple suit, which has this amazing property of actually keeping me dry (knock on wood). On the surface interval, we were treated to some croissant sandwiches (the Kitty's favorite, thanks Jim). Just to be fair, I guess I have to whip out the stamp of approval for the Escapade too (although the Escapade always had the stamp of approval, sandwiches or not!). We also took a little detour for a whale watch -- there was a humpback. I only got a brief glance at it breaching, and then saw its spout a couple of times. When the conversation turned to where/whether to do a second dive, there was a lack of enthusiasm. Several people planned to sit out a second dive, and I registered ambivalence about (would go if we did it, but wasn't totally attached to it). Luckily Rob and Clinton were enthusiastic enough to make up for the rest of us, and Rob suggested Ballbuster (once he woke up from his Cheetos stupor). So that's where we went. Based on my extreme ambivalence, I told Kevin he had to lead :) I also suggested a relatively short bottom time (35 minutes) because I suspected I would get cold. We headed into the water, and it was pretty ugly on the way down. 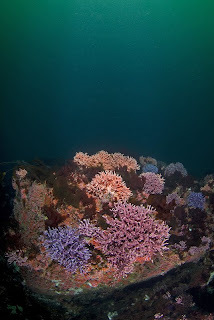 But it cleared up somewhat by the time that we got down to the reef, and suddenly the pink (Corynactis) with white spots (metridium) appeared out of the haze. After checking the anchor, we meandered around the reef pretty slowly, pausing here and there to pose for pictures. 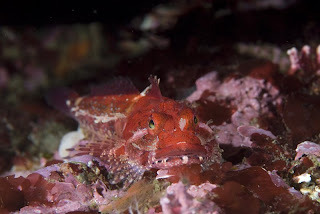 I noticed a bunch of juvenile rockfish at one point, including one that was nuzzled in a piece of staghorn bryozoan, between a row of horns -- very cute. It was very dark and green, which as far as I can tell, it always is at Ballbuster. Rumor has it that it can occasionally be better, but I've never seen it :) Eventually we made it back to the anchor line, and Kevin suggested we doodle around for another 5 minutes and then head up. So Rob took a few final shots of us posing next to Metridium, and then we headed up. 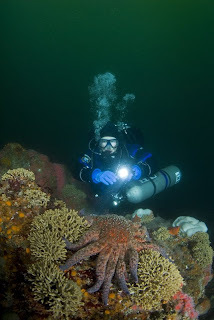 All of the underwater pics are here, and topside pics are here.